Python (from www.vpython.org) Python is a powerful object-oriented programming language initiated by Guido van Rossum in 1990. See the essay by van Rossum on "Programming for Everybody," www.python.org/cp4e. It is easy to start writing simple programs in Python, and even using classes and objects involves a relatively gentle learning curve. Python is cross-platform (Windows, Mac, Linux). It is open source (and therefore free) and supported by a sizable developer community. Python is a general-purpose programming language with significant numerical capabilities, though a common use of Python is managing servers, administering systems, etc. See the extensive web site, www.python.org. A good textbook is Learning Python by Mark Lutz and David Ascher, O'Reilly 1999. 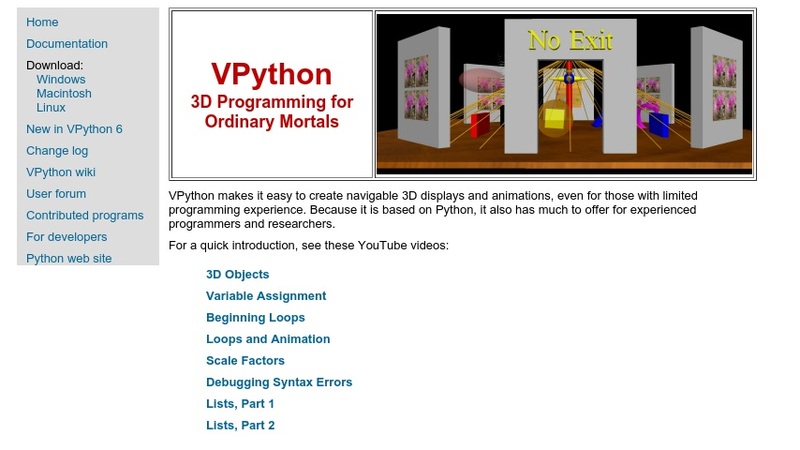 Realtime 3D Graphics: Visual Python itself does not provide graphics output. The Tk graphics library can be used to create 2D graphics, but it is difficult to use. In the spring of 2000, while a sophomore in computer science at Carnegie Mellon University, David Scherer created a 3D graphics module for Python, called "Visual," that is exceptionally easy to use. A program can create 3D objects (such as spheres, curves, etc.) and position them in 3D space. Visual, running in a separate thread, automatically updates a 3D scene many times per second, to reflect the current positions of the objects. The programmer does not need to deal with display management, but can focus on the computational aspects of the program. The user can navigate in the 3D scene by using the mouse to zoom and rotate while the program is running. Visual supports full vector algebra. Use in Classrooms Students in introductory physics courses have been using VPython to do computer modeling. VPython lets students focus on the physics computations without having to write explicit graphics statements yet obtain 3D visualization. Students can do true vector computations, which improves their understanding of the utility of vectors and vector notation. Platforms Supported The Python language itself is cross-platform. The Visual module, and the Idle integrated development environment, work with Python on Windows and Unix/Linux/MacOSX. Published Articles A journal article about VPython has been published: Scherer, D., Dubois, P., & Sherwood, B. (2000). VPython: 3D Interactive Scientific Graphics for Students, Computing in Science and Engineering, Sept./Oct. 2000, 82-88.